Most of us have those days when we couldn’t use some more hours of sleep, so I have found helpful tips for brightening tired skin! For me, feeling tired is bad, but looking drowsy and tired is terrible! Don’t walk around looking like a zombie! You can wake up tired skin and look even more awake with only a few beauty products! Check out some ways to brighten tired skin! If you have got some free time in the morning, do a refreshing face mask to wake up your tired skin. Using a calming and cooling mint and cucumber mask will help revitalize your tired skin! Mash up a cucumber, and then place it in a microwave-safe bowl with some water and microwave on high for 2 minutes. Now, add ¼ cup of fresh mint leaves and microwave again for about 2 minutes. When it’s cool, apply all over your face, leave for 15 minutes and rinse off! It is not an easy thing to do, especially when you are sleepy, but it actually helps. Grab some ice cubes and rub it gently all over your face. If you do not have ice cubes, splash really cold water on your face. Ice or cold water will help stimulate blood circulation and tighten your pores, so your skin will look healthy and glowing! One of the best ways to brighten tired skin is to exfoliate it. Exfoliating is important for removing dead skin cells and revealing smooth, radiant skin. Using a scrub on your body and face will instantly make you feel more awake and refreshed. Use a scrub a few times a week to keep your skin feeling and looking brighter and better! If your skin needs more help than just a splash of cold water or ice, wake up your tired skin with a de-puffing product. Use a roller ball with an eye serum that will help brighten up tired-looking skin and take the puffiness. Gently massage and revive your skin! If you often don’t get enough sleep, staying hydrated can be your saving grace. Tired and dehydrated skin looks sallow and dull. Start every day out with a big glass of water and stay fully hydrated throughout the day to help replenish your skin and regain its natural glow! Add some lemon to your water for a vitamin C boost to keep your skin clear! An easy way to look much more awake is to use chilled skin care products. Put your facial moisturizer, eye cream and toner in the fridge overnight and apply them in the morning. The chilled products will ease down the puffy look and soothe tired skin. Also the cold temperature of the products will stimulate blood circulation and invigorate skin without using ice or cold water! Blush will make you look much more awake and also give your cheeks a fresh, pretty flush of color. 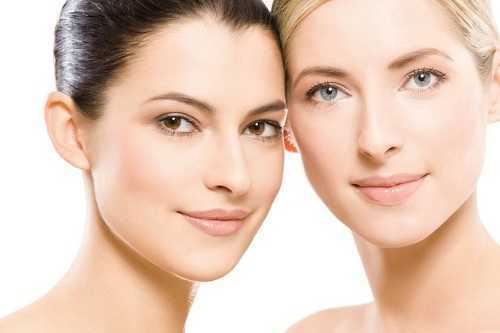 Why walk around with pale cheeks that make your skin look dull and tired when blush can instantly revitalize your skin? When we need to look more awake, concealer is one of the best things we can use! It helps camouflage dark circles and hide other imperfections. Use only a good quality concealer that will hide the giveaway signs of all those restless nights. It’s really easy to brighten tired skin when you have got the right tools! Doing such little things as hydrating and exfoliating can do wonders for your tired skin, but we can also use some beauty products! Do you have some tips for brightening tired skin? Share your thoughts, please!